On Saturday June 22nd 1918 the community of Leongatha and District gathered near the Leongatha Butter Factory to plant an avenue of trees in a single day.. The Great Southern Star reported the event. The Progress Association decided to plant a row of trees along the Yarragon Road from the butter factory to the Labour Colony (Horn St) and for a short distance along Wild Dog Valley Road. 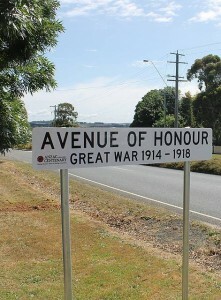 This avenue was to honour all those from the West Riding of the Shire of Woorayl who enlisted to serve in the Great War. An appeal was made to the family and friends of all the soldiers from the west riding to come along and help. The 250 elms and oaks were provided by the Mossvale nursery and were to be planted alternatively. The Shire engineer, Mr. Bate, pegged out the land and all was ready to begin at 9 am. A Mr. Livingston took several days preparing holes for the trees and the Shire agreed to provide all the tree guards. There was a wonderful response from the public and hardly a family for miles was not represented. People came from everywhere bringing spades, shovels, axes, saws and hammers. By 4 pm the task was completed with all the trees planted and guarded. The local MP Mr. Mackay planted a tree in honour of General Birdwood who commanded the Anzacs from 1914 until early 1918. Nameplates for the trees were donated by local builder Mr. F W Morris. Funds were collected on the day to cover the cost of inscribing the nameplates. Relatives of the men were asked to care for the tree that bore their soldier’s name plate. The youth of the area were asked to treat the trees as sacred. Over the years some of the trees have died or were removed but the avenue is still a unique living historic feature in the town. The original nameplates were removed in 1968. In 2015 the names were placed on this new wall. Originally 250 soldiers were honoured. Recent research has uncovered more names and these names have been included on the new panels.